Thailand has received a strong vote of confidence from tourists all over the world who are flocking to the Kingdom in spite of a barrage of negative press over the last twelve months from international media. Thailand’s tourism prospects have been on the up and up since late last year. The latest boost is an annual survey which again ranks Bangkok the most popular and visited city in Asia. Based on expenditure and visitors numbers the Thai capital is well ahead of nearest competitors Singapore and Tokyo. And the news gets even better with Phuket and Pattaya ranked 5th and 8th respectives beating destinations like Seoul and Mali. The survey showed that tourist visiting Bangkok were responsible for a whopping 107 million visitor nights compared to only sixty eight million for for Kuala Lumpur which came in third. Bangkok had 21.9 million visitors while Phuket and Pattaya had 9.3 and 8.1 million respectively. ‘The figures showing a massive success for Thailand in terms of tourism, significantly much of the gains come from Asian visitors as many shun long distance travel to Europe because of the migration crisis and terrorism fears,’ says James Morris a commentator in Bangkok. The figures show the confidence there is in Thailand’s stability despite the bombing in Bangkok in August 2015, a terrorism scare at the end of the year regarding Isis and negative press in the western media ranging the murder of a British backpacker on the island of Koh Tao and the human trafficking scandal regarding Rohingya migrants. Thailand’s Tourism Minister shocked many people on Christmas 2015 when he announced that tourism figures for 2015 were up 25 % on the year before. While this may not in itself be surprising as 2014 was the year when Thailand suffered political turmoil and a coup, the figures come just weeks after Thailand was at the centre of an Isis terror threat scare. ‘I think Thailand for all its worth between the jigs and reels is a pretty safe bet, I come here once or twice a year,’ says John McCarthy from Co. Limerick in Ireland. The very positive Thai tourist figures seem to bear him out. Thai security chiefs had already dismissed the alleged Isis threat and assured the public that Thailand is a safe place to visit. ‘We get warnings like this many times, there is no critical intelligence of IS presence in Thailand,’ said Police Maj. Gen. Apichart Suribunya who is Thailand’s Interpol Director. ‘There is no credible threat of an IS attack not now from Interpol there is no critical intelligence and no threat of an IS attack in Thailand.’ The fear came to light when a document emerged indicating that Thai security services had been warned by the Russian Federal Security service that 10 Syrians had entered Thailand from mid to late October 2015 who had links with Islamic State. It was suggested in some sections of the media worldwide and in Thailand that there may have been a threat to Russian interests or tourists in Thailand. In the aftermath of Russia’s military and air offensive against Islamic State in Syria. It is understood that in September Islamic State were held responsible for the downing of a Russian airliner in Egypt’s Sinai province. The reaction by security services in Thailand was to play down and dismiss the threat while police did track all Syrian nationals who had entered the country even identifying Syrian nationals and small businessmen who had overstayed their visas in Thailand the authorities were very certain that no threat existed. The Thai police also launched an investigation into the leaking of the document which they suggested should not have occurred. Gen. Chakthip Chaijinda of the Royal Thai Police confirmed to the media against those responsible for publication of the document as the authorities in Thailand were anxious to avoid panic and damage to the country. ‘I am afraid that people may panic but in fact it’s routine for us,’ the police officer told the media. ‘It’s usual for Syrians to travel here for tourism.’ The Royal Thai police officer also went further and assured reporters that the Thai authorities had no evidence of activity by Islamic State in Thailand. Anthony Davis who works in Bangkok for the security organisation IHS Jane’s seemed to endorse this view when speaking with Australian media. ‘In the aftermath of the downing of the Russian airliner in Sinai the FSB bluntly would be in panic mode,’ he told an Australian media outlet. ‘They would be looking at areas of Russian vulnerability globally and particularly areas with large numbers of civilians. Thailand would be pretty close to the top of the list there,’ he said. This security expert also confirmed that Thailand was well equipped and positioned to deal with any potential tourist threat. ‘With the Thai economy hurting at the moment, tourism is becoming increasingly vital and the last thing Thailand needs is the threat of Islamic State operatives lurking around the bars and beaches that bring in so much foreign cash.’ Indeed in the aftermath of the revelations many commentators suggested that Thailand had become such a transit hub that the range of people traveling in and out of the Kingdom was vast and complex. Mr Davis of IHS Jane’s told the Australian media: ‘We have large numbers of Chinese very large number of Russians, of westerners, of Australians, you name it they’re here so it’s a target rich environment,’ he said. A middle East specialist Jaran Maluleem from Thammasat University speaking to Thai media suggested that it was a fine balance between trying to decide whether IS fighters would consider Thailand a target or a safe haven.’ Mr. Jaran suggested that Thailand was easier to enter than many other states in the Asean area and pointed to its reputation for underground services such as the sourcing of underground or counterfeit passports. Other commentators have pointed out that Thailand has a very effective police and security service with a population that is very supportive of the government. In the aftermath of the scare, Thailand’s National security Chief General Thawip Netniyom did reveal that Thai authorities had implemented stricter security measures in the run up to Christmas 2015 and the New Year. Despite this he reiterated that the public had no cause to panic. On August 17th 2015 Thailand suffered a deadly bombing incident in the centre of Bangkok the famous Erawan Shrine. Twenty people were killed and a successful investigation by the Royal Thai Police showed that the attack was the work of a bombing network which involved nearly 20 people, some of whom had entered the KIngdom to carry out the attack. While some reports linked the attack to the plight of Uighur muslims and connections in Turkey, the Thai authorities have suggested that the attack was in fact linked to an extensive crackdown that Thai authorities have launched in the fight against human trafficking. Over 2014 and indeed 205 Thai authorities have been ramping up efforts to reduce illegal entry into the country detain those living irregularly within the Kingdom. 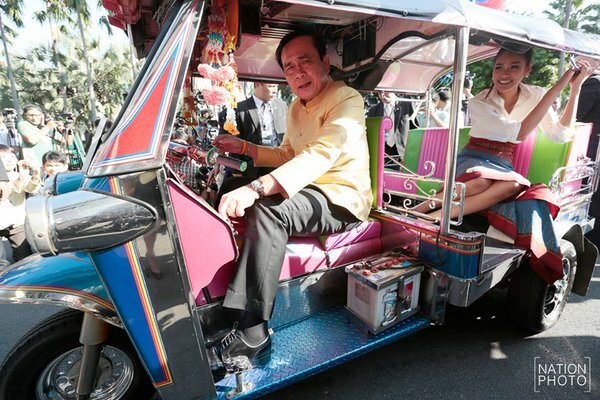 The good news about Thai tourism came just days after Thailand’s entrant in the Miss Universe contest in Las Vegas won international acclaim for her Tuk Tuk costume. Miss Universe Miss Universe Thailand Aniporn “Nat” Chalermburanawong appeared in a strapless mini dress with handle bars and her costume was adorned wit Thai flags, lights and streamers. The colourful display came at the right moment for Thailand and reinforced the message that Thailand is a fun place to visit. In the run up to 2016, Thailand’s Prime Minister Prayuth Chan Ocha hosted Miss Universe Thailand prior to a cabinet meeting. Miss Anaporn was a huge hit on Twitter and other social media with her national costume entry. Her appearance did wonders for Thailand’s image and highlighted the happy go lucky nature of life in Thailand in contrast to negative foreign media reports. There are many who think that Thailand’s portrayal on the nternatiomnal media across the world has not been balanced. ‘I think Thailand suffered lately from being stereotyped unfairly and the latest figures for tourism and visitors show that most people have confidence in the country,’ says James Morris in Bangkok.